Regular readers will know that I’m no great fan of the Police Community Support Officer (PCSO) role in UK policing. I’m not totally against them per se however; I can accept they have their uses in policing. My issues are usually to do with the way in which they, are selected, trained and deployed in our community. As in most walks of life, there are some very good people performing the task however; through no fault of their own, the role of PCSO has unfortunately become something of a byword for policing on the cheap. 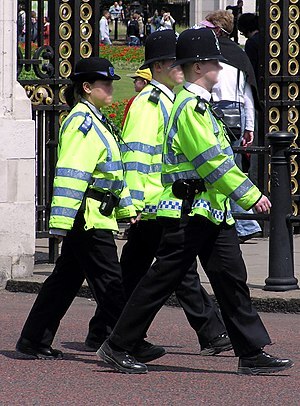 The original idea for a uniformed supportive role in policing was mostly sound however my angst is usually as a result of one or more of the following; (1) the role has attracted many individual who wanted to be cops but couldn’t make the grade in full-time warranted policing, (2) there has been significant ‘mission creep‘ in the way they are used/deployed and (3) they are often presented/used in manner designed to deceive the public. Despite all the mission creep and deception, usually the fault of local police commanders and not, as many would suspect, the government and politicians, the National PCSOs website correctly acknowledges their original (and mostly accepted) role profile. Most can understand, if not always agree, that it makes logical and financial sense to utilise PCSOs for tasks where a fully trained warranted (aka: expensive) police officer isn’t actually required. Traffic control and scene guarding i.e. public safety, is one such common situation that can be a massive drain on expensive resources. A job for the PCSO? The above picture is from a recent incident in Northallerton High Street where (I assume) a car had been on fire, or at least smoking a little? The prompt actions of our the local Fire & Rescue Service had obviously averted anything more serious. Taking details from the vehicle owner and ‘damping down’ was in progress when I came across the scene. When it comes to public safety (and the safety of their crews), the Fire and Rescue service are generally highly trained, skilled and consummate professionals, be they full-time or retained staff. Each member of the fire crew at this incident was going about their business in a calm and methodical manner. The Fire appliance (out of shot to right) was parked in a standoff/guard position in the road and, probably immediately upon arrival of the crew, the footpath had been cordoned off to keep the public at bay. But, making the scene safe also produced additional hazards. Once the fire had been extinguished, or the cause of the smoke had been investigated, the inherent dangers of the incident transferred from the vehicle and the footpath to what may occur on the road. As is generally the case with incidents of potential risk, the actual dangers evolve and can be ever-changing. It’s one of the reasons why dynamic risk assessment is so important in managing risk during live and ongoing emergency situations. “Risk is what it is,” says Duncan Spencer, a senior consultant in risk management and author of the Institution of Occupational Safety and Health (IOSH) course on dynamic risk assessment. “The situation may be dynamic but the risks, while transitory, are predictable from experience. Risk is an evaluation of hazard and likelihood. The only thing that changes is whether you are carrying out the assessment in advance or at the time. The necessary positioning of the fire appliance created a restriction for vehicles using the road. Closing the footpath, also a safety consideration, impeded the passage of pedestrians. Those on foot were then obliged to walk around the fire engine, on the road and into the path of oncoming motor vehicles. Ones being piloted by mostly frustrated and impatient drivers; a recipe for an accident and/or injury. To my mind, and probably that of the fire crew, the inherent dangers that I observed were in the road and not on the footpath or with the vehicle, which appeared to have been made safe… Step in Mr PCSO who, with his ‘TRAFFIC’ authorisation boldly emblazoned in yellow on his epaulettes, obviously knew something different to me? Either that or he was just in awe of the firefighters professionalism and forgot his training. Always assuming he’d had much in the first place? The manikin for uniform, and politically contrived face of modern UK policing, simply stood gawping with hands in pocket and floundering like a fish out of water. Meanwhile, pedestrians were forced to run the gauntlet of irate drivers less than fifty feet away, a dangerous factor that he was so obviously oblivious too! It’s not all bad and, by way of a compliment, at least he looked a little smarter than he normally does. This incident went a good way to evidencing some of the issues I have with PCSOs. This particular CSO needs to understand that when he dons his uniform, he (unfortunately) is the face of modern policing. The public don’t see him as a CSO, they see him as a Cop. This is even more pronounced in our area where, unlike many other parts of the country, there is precious little difference in his attire. It isn’t easy to differentiate between CSO and Cop, at least not from any distance… Whether you see this as intentional deceit or the accidental consequence of budgetary constraints in uniform procurement is up to you? The role of CSO is here to stay, whether we like it or not but I would ask is that we; (1) do more to select the right people for the job, (2) ensure they adhere to a clearly defined (and nationally applied) remit, (3) train them correctly and last but by no means least… dress them in such a way the public have a fighting chance of differentiating between them and fully warranted police officers!